We've been on vacation for 2 weeks sailing around the BVI's - doesn't it just sound cool? A wonderful trip- but it's taking me another week to get back to reality of work and exercise and blogging! I've been cooking since we got back, but I can't even remember what...apparently I'm still on Island time. This soup is a really super, super simple. It's not completely a true, classic egg drop recipe, but what recipe of mine is? It's always about making what you have work, or working with what you have. I had thought about adding some sausage or chorizo to this for a slightly heartier soup, but I'm still on Island time and forgot. Doesn't mean you can't though- even some left over roasted chicken would work well. The eggs offer great protein on their own and it's just fun to see the strands firm up. I used chili oil as a final topper- it gives great flavor and the little floating orange pools of oil are so pretty. 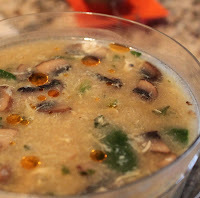 Give this a try for a simple asian-esque soup. Tips and Techniques: Lightly whisk the eggs with a fork before adding to the soup; slowly pour the eggs through the tines of the fork to help create the thin strands. Whisk the soup in one direction using chopsticks. If you want your spinach to be more firm, add it in after the eggs. Do not continue to cook the soup or the eggs strands will become rubbery. Add the spinach, push down. Now add the eggs, slowly pour them through the tines of the fork, in about 3 batches. Stop to the stir the soup (in one direction, just once or twice around) using chop sticks. Repeat until eggs are all in the soup. Taste for salt (or soy sauce) and pepper- add if needed. To serve - add a small drizzle of chili oil to each bowl.